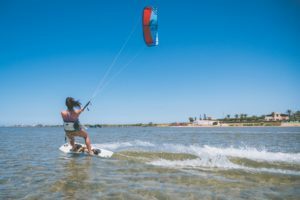 Yes, jumping high and doing technical tricks is stunning, but majority of kiters is happy if they can cruise only and ride upwind without any problem. Here are our 5 hot tips, how to improve your upwind riding! When wind is lower and is harder to go upwind, majority of kiters are solving it with increasing kite size. This is often not the best solution, since bigger kites have more pull and its harder to edge with them against the wind. Very effective solution is to change the board for bigger size, or even better surfboard! 90% of beginners who try to go upwind have the mistake, that they want to start edging and riding in upwind direction right from the start of the ride. But it’s like riding a bike uphill, it’s very hard to start pedaling in the middle of the hill. Better first aim little downwind, get the speed and after cut edge and go hard upwind. 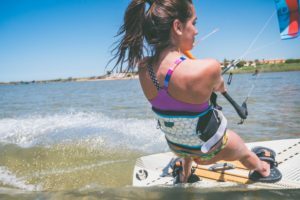 Fix your body position when going upwind! Body weight should be on back leg heel, front leg should be straight and lead the direction. With you head you should be looking upwind, this should help turn your torso and hips also in riding direction. Have straight hands and do not pull the bar too much, keep it on “sweet spot”. Always find a target which you can reach. Look what upwind trajectory other kiters have and estimate where can you go, it can be some point at the beach, boat, whatever. Also work with the wind, if you feel the wind is in some area lower, go slightly less upwind and opposite, if you feel higher wind use it to go harder upwind. You can see and predict the wind at the water in front of you. its only in your head! 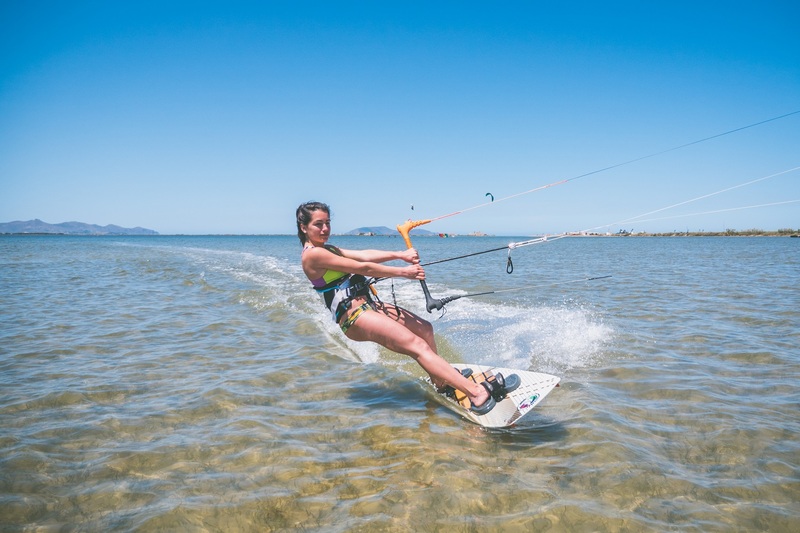 If you ride in one line starting at the beach and try your tricks there, you will be always under pressure to go upwind, and you can have similar trouble as mentioned in point 2. 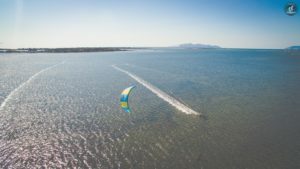 It is recommended to first focus on getting upwind and then keep riding there, you will feel safe, since you will have some upwind reserve in case you fall or wind goes down.